These are the most important updates of the thread. I've added them to the first post for easy reference. Below is the original starting thread. A buddy of mine has built two cabinets, the first was a Street Fighter themed Fighting game cabinet which he built before I met him and I've never seen in it person (He sold it, ha). Somewhere in 2006, he had completed work on his second MAME based stand up arcade unit... well.. got it working anyway (it is out of commission currently). About a year later I began toying with the idea of building one of my own but I shelved the idea... for the time being. When Soul Calibur 4 released, I bought a Hori Fighting Stick. Then 1942: Joint Strike and Street Fighter IV came and I started getting the arcade bug again. Unable to get the arcade fix from the broken down cab of my friend's. I decided, since I now have my own place, perhaps it's time to build a cabinet geared to my preferred style of arcade games... such as 1942/43, Gunbird, Gunbird 2, Xevious and various other airplane/spaceship scrolling shooters. So, I began surfing the web for ideas, and my buddy pointed me toward BYOAC. Which lead me to buy Saint's book and I have delved into research. Being a novice, I had originally decided to follow the plans on the CD for Lucid's arcade unit, but being an artist, I naturally couldn't restrict myself to completely follow an already established plan (Have to make things more complicated for myself it seems). So I have been working to modify the Lucid plans with some of my own design elements while paying attention to the structure in order to ensure stability. 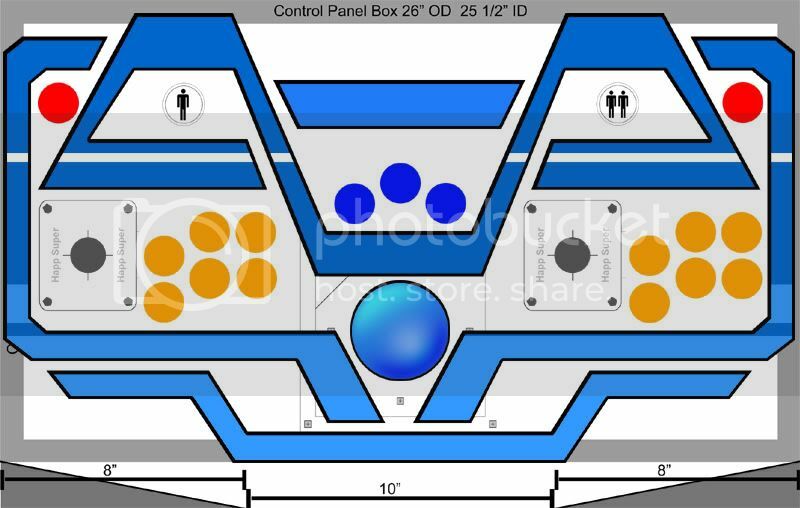 Control-wise, the plan is to have two Happ Super 8 way joysticks with 6 buttons each to allow for fighting games, a trackball with 3 buttons for mouse functions as well as player 1 and 2 start buttons and a pause and exit game buttons. I'll be wiring up the coin door to allow for tokens rather than using coin buttons. I'll be using a 20 inch CRT monitor, oriented vertically to accommodate vertical shooters. This weekend I plan to begin some of the the construction work. I'll be building what I call the "Control Panel Stand". Since the control panel isn't designed to rest on the sides of the cab, like in the original plans. I decided the best way to get the look I am going for was to build a separate section for the control panel and build the rest of the cab around it. Since the most heavily modified part of the unit is the CP, I decided to build this section first. That way I can take real world measurements off of it and design the rest of the case around it... namely the sides. I have various drawings and plans done up on paper, Photoshop and Illustrator so I will post a few things as soon as I get them scaled down and organized. I'll also post some pictures of my progress after this weekend as well. will look forward to seeing it. i like shooters but,unfortunately there are some realy good horizontal ones too.side arms,rypes etc. was tinkering with the idea for my mame cab (still in progress) but,i dont want to comprise too much,i can live with the bezel that gameex will put on the sides of my vertical shooters so i am going to leave it horizontal as theres some decent neo geo ones that are vertical and run on horizontal monitor. Ya, my buddy's 2nd cab has a vertical monitor on it and we ran all sorts of Horizontal games on it no problem. Basically my thinking is, I'll be playing mostly 1942/43 and Gunbird 2 etc on it, so I want to maximize that. If Horizontal games take a minor hit it's ok. They looked fine on the other cab. 4-5th Revision of the control panel. Left red Button will be pause and right red button is exit game. 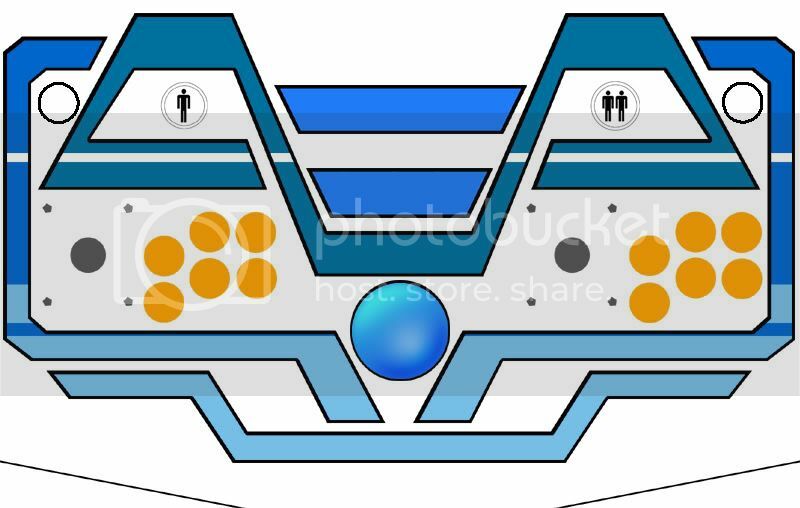 The 3 Blue buttons are mouse buttons and then 6 buttons for each player. as for your control panel, you may want to rethink the trackball buttons. having them directly above the trackball is not really a comfortable place to use them. also, they are completely unnecessary. you can have any of your other buttons be mouse buttons. you can use your regular player 1 buttons for any trackball games. Thanks, I'll look into that for sure. Quick question though, when you wired up the buttons to the P1 5 and 6 did you run a lead from the trackball to those buttons and piggy back the line? and you are all set. as long as that is set in mame.ini any mame game can then use the mouse buttons. Cool I'll check that out. The reason I went with the 3 mouse buttons is because that's what Saint suggested in the book. really want to keep the CP and arcade as a whole looking as authentic as possible. Which means as few admin/system buttons as possible. Or at least hiding them from view. I just got paid today, so tomorrow after work I'll be heading to get MDF and 2x2, drill bits and wood glue. Hopefully next week I can get all my figuring done and I can complete actual construction and move on to wiring and mounting the guts and monitor. I can't quite tell because you've obviously modified the Lucid design, but it does look like you may have misinterpreted the dimensions as I almost did. I've since lent the book to a friend, so I don't remember which it was, but one of the dimensions on the layout looks like it represents one section, but it is really a larger section. The total height of the cabinet should be somewhere in the neighborhood of 6 feet tall. Just be careful, I remember someone made the mistake before and it made for a very tall bezel that looked awkward. 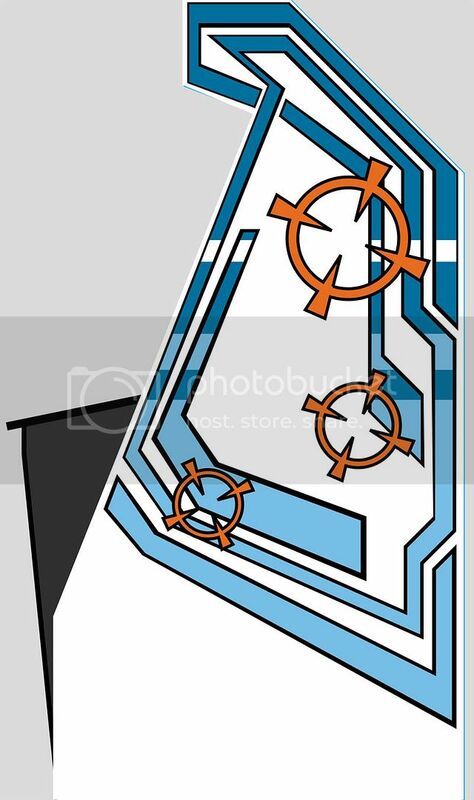 thats a good point, looking at that diagram, the section between the control panel and the marquee looks really tall. way too tall for a 20" monitor. do you have the dimensions of that drawn up? Actually when I look at my graph paper and that photoshop picture there it certainly something mismeasured. I'll look into it and fix that up. cool...it is easy to mess up stuff like that. just make sure you get it sorted out before you do the cutting. Ya, the CP is roughly the same height as the Lucid plans I think it's sitting somewhere around 36" high to the top of the CP... Actually when I was doign that up in Photoshop last night I was like... this look oddly tall. Then I figured it was an optical illusion, but now that other people see it as a little off, I know I wasn't imagining things. Yup... in my infinite wisdom, I misread the 74" on the rear of the Lucid plan as being the height of the back until the 45 degree section to the top.... wow I feel mildly idiotic.... I've got stuff going on tonight, but I now know where the mistake was made. Easy enough to fix. Construction started this afternoon! I built the Control Panel Box and the Base. I also cut the sides of the CP stand. Unfortunately I left my camera at my parent's house so I can't upload pics just yet, but I'll stop by there tomorrow and pick it up! Also, I decided to go with Severedhed's suggestion of removing the mouse buttons from the CP and wiring them to player 1's controls instead. So I'm working on a new layout for the Control Panel too. Today I also ordered the T-Molding for the CP stand, 12 Orange Happ horizontal M/S pushbuttons, a pushbutton wrench and 2 Happ Super joysticks. I still need to save up the money for a Happ Trackball and when I get ready for the trackball I'll order out the Optiwiz. I am totally on a bit of an accomplishment high at the moment, haha! i think you will be happy with your mouse button removal. it has been my experience that the less clutter on the control panel the better....especially when other people are using it....my panel is pretty streamlined at this point, and people still get confused. If you havent yet picked up a trackball, may i suggest the U-Trak from ultimarc. 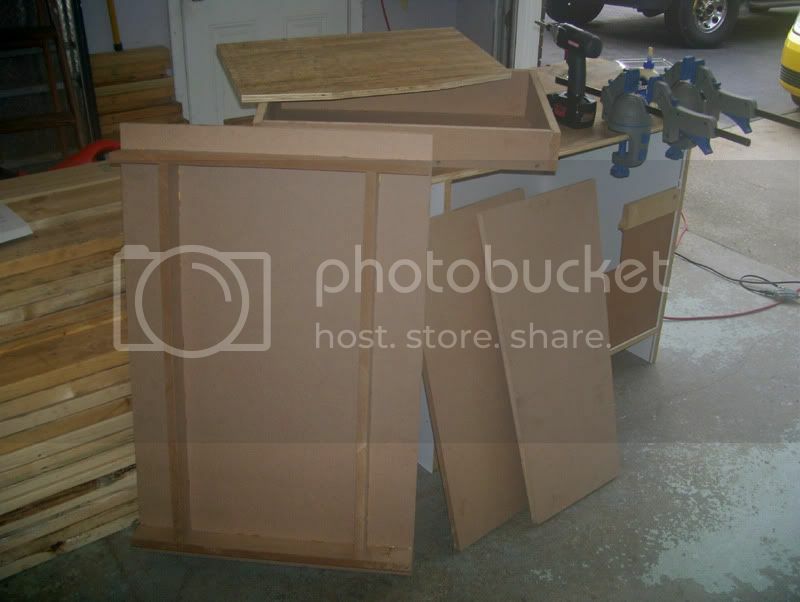 it is an excellent product and it is so easy to mount in a 3/4" thick panel. they have a nice little LED lighting package for it too. the only thing i don't like abut the utrak is it's usb interface, it does not support mouse buttons. so when i got mine, i bought the utrak and lighting module, but bought an optiwiz from groovygamegear to interface it to the PC. the optiwiz is very cost effective and supports 3 mouse buttons. I'm also thinking of moving the Pause and exit buttons from the CP as well. Not sure yet though. i've seen some people put admin buttons like that on a separate panel below the monitor or something. I'd make sure that pause and exit are somewhere obvious for people. it has been my experience that guests don't want to bother remembering shifted key combos. You could probably get away without the pause button, but the exit button is used so heavily, i'd try to keep it simple for people to use. Alrighty, as promised! The first two progress pictures! I didn't attach the sides to the stand yet because I need to get a 1/16" slot cutter. I may have tracked one down locally, so I won't need to order it online. I plan on painting this section Black and have ordered the black T-Molding for it as well. I have to wait to add the face plate to it until I get my hands on a coin door. Which maybe be a little while. But, now I am in the process of designing the sides and the rest of the cab! More progress to come! cool. i'm liking the artwork. I am really liking the design of you cab. Looks like it will be perfect for shumps. I agree with severhed i'm liking the artwork a lot too, just wondering if you're going to paint it on by hand or have it made for u.. i think with some clever taping and a steady hand you could paint it on. The side art looks like something that actually came out of an arcade.. i think u nailed it on the firs try. just wondering about the white space at the bottom of the cab, if you're going to fill it up or leave it blank.. either way it balances the side art pretty good. But i was thinking you could ad "shumup!" like on your marquee to fill in that space, either way keep up the great work. So far it looks pretty spectacular. Can't wait to see it finished! I plan on hand painting the side artwork on the cab with creative taping and a few techniques I've used with some actual paintings I've done. I would love to get some graphics made for the sides, but since it's a little odd shaped, I don't want to risk it. Plus I know I can paint it on with rollers or a sprayer and have it look clean. The colors are actually Behr paint colors and I have the paint chips at my apartment for reference. I may play with the white space on the bottom, but I think I may leave it blank. Also I am not sure if I want to use White T-molding on the cab sides or blue.. True! As much as I like the look of Vinyl. I would much rather take the time and paint the side art myself. I'm going for an old school, late 80's early 90's look, maybe with the right amount of finesse I can get it to almost look screen printed! I think this would look good if the top, rather than the pinched look, was more lowboy-ish. While a lowboy would be nice for portability. I think I am going to still with a full cabinet sized arcade unit. Yeah, I just mean the topmost part; You've got a solid looking base, and the top most part looks disproportionately smaller. I think it's the pinch. 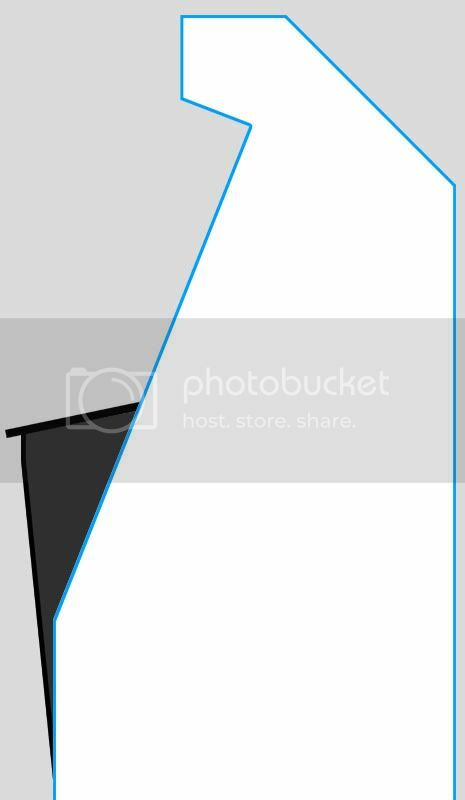 Perhaps try toying with the idea of making the top right angle parallel with the internal angle (below the marquee). Or otherwise. It looks like it has a big body and a little head. Nice artwork by the way! Actually after I posted that I started toying with the idea of changing the top. I want to keep the angles and straight lines look and stay away from curves. But maybe I can work out some other ideas for the top marquee area. Since that is basically a copied section of the Lucid plans still. For the sake of it being my first Cab attempt I may leave it as is. But I'm going to break out the graph paper and see if I can modify it a bit. I like that forward leany bit for the control panel that you've done too. 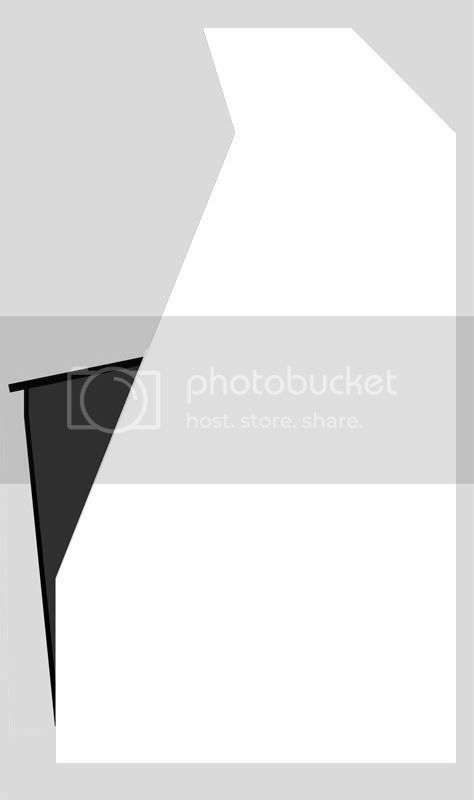 Or maybe something like this? Keeps the marquee sticky-outy piece on the front of the top and keeps the Marquee vertical rather than on an angle. 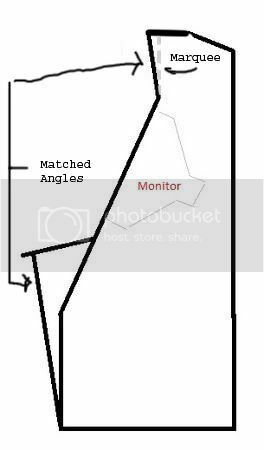 Then match the angle of the front edge of it with the front edge angle of the CP stand. Hmmmmmm I think I dig it. I was playing with that idea last night before I went to bed. I think this is the new side design. Just need to work out the dimensions and I'll be good to go. Nice. Are you modelling this up in 3D? Would be interested to see how it looks from half front on. I don't want to dictate your entire design for you, the final decision is yours afterall But if I may be so bold as to give my opinion once more; I preferred the lesser angle for the top right most - back of the cabinet - slope. One point to note: I know you like the sharp corners, but I believe that for t-molding they will need a slight radius. I could be corrected here though because I have yet to get to the t-molding stage on my project. If I may suggest some more curves? Nope I'm not actually modelling it in 3D. 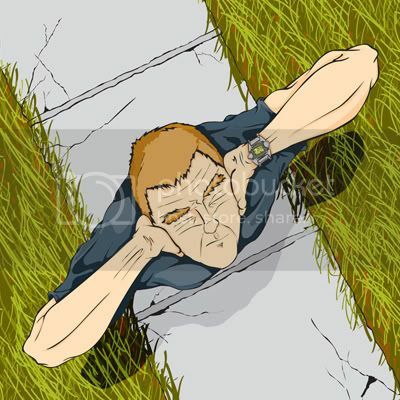 I was going to try to work something out in photoshop or illustrator, but I've not had a chance to do it. I'm going to do some testing once I get my T-molding in hand (it's on order at the moment). 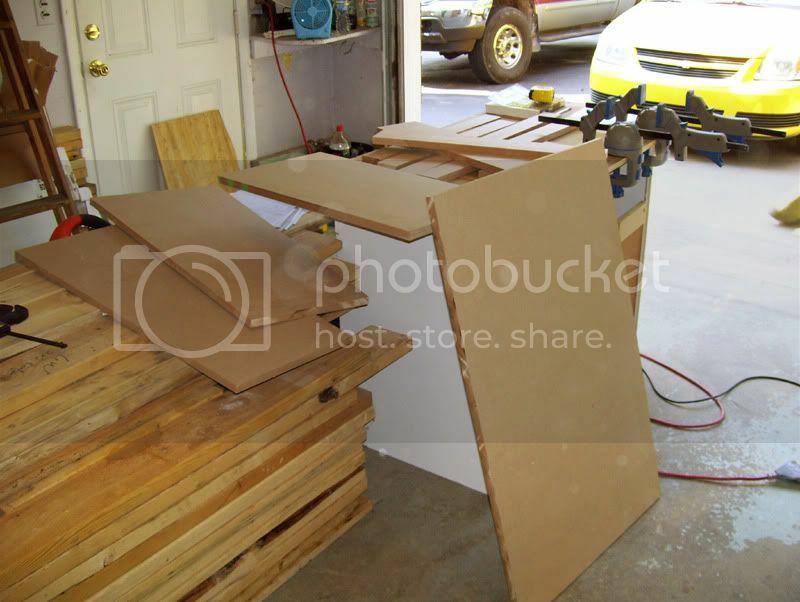 Once I get it, I've got some scrap I can groove out and try either sharp corners or slight curves. Also I have another idea, which I need T-molding for. I'm keeping that one under my hat for the moment though. Awesome. Like I said, I haven't got to the t-molding part of mine yet. I've got two corners that I might need to round off a bit, not sure yet. Page created in 0.159 seconds with 61 queries.